Porters Fruit | Honeywood (Dr. A. J. Porter) Heritage Nursery Inc. The following excerpt is from the article on Honeywood Nursery written by Allan Daku for the Parkside and District History Book printed in 1991. It sums up fairly well the why and when in relation to Bert Porter and what turns out to be his life’s vocation. Honeywood Fruit Farm and Nursery issued its first spring price list in 1939. The list offered seven different varieties of strawberries, three different raspberries, the ‘Pixwel‘ gooseberry, five crab-apples, four apples, six plums and seven different plum-cherry hybrids. Through the 1940‘s however, the raspberry and strawberry were king and queen at Honeywood. Several acres were devoted to the two crops. In spring and fall, Bert sold plants of both types and through the summer he sold the berries. Bert began propagating and growing his own stock and the locally produced stock settled into area yards and gardens much better (than stock received from Estevan). He began growing raspberries and strawberries as a market garden operation. While customers were encouraged to come to the nursery to pick berries, most of the crop was sold off the nursery. Bert began employing neighbourhood children as berry pickers and the tradition of providing employment for area young people continues to this day. The weather back then was as fickle as it remains today. The varieties Bert was growing did not always stand up to the cold winter temperatures, the late spring frosts or the hot and dry summers. This was especially evident in the strawberries and raspberries. Bert‘s scientific bent spurred him to begin some breeding work to improve the dependability of the stock. By this time he had established contacts in the horticultural community across the country and had tried most of the varieties available. Finding most of them lacking, he decided to “make” his own that would be to his own specifications! Throughout the years, many varieties of apples, crab apples and countless other varieties of fruit were planted and tested for taste, disease resistance hardiness at Honeywood. 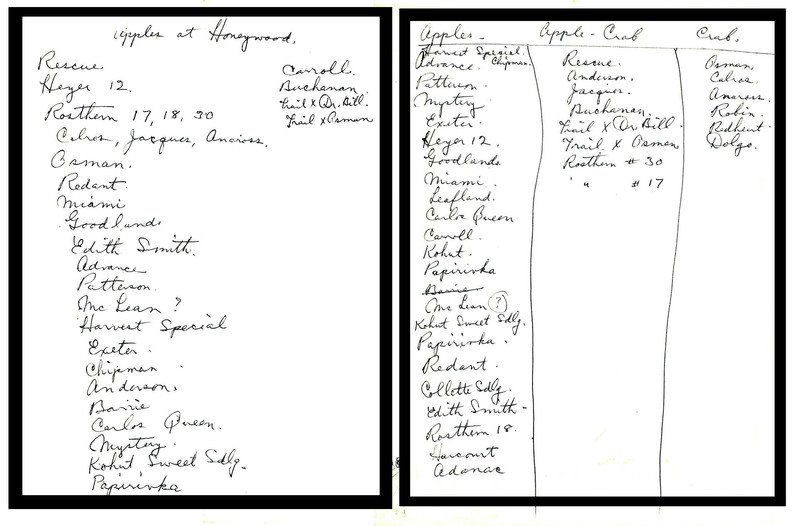 Bert’s handwritten list of apples/crab apples growing in the 80‘s.